This is the fourth post on Vegetable Gardening with guest speaker Judith Sorg. If you missed the first three please link here to read. Now for -How to Plant a Vegetable Garden in Four Easy Steps – with Judith Sorg. If you love to cook, learning how to plant a vegetable garden is one of the most rewarding things you can do. When you grow your own garden, you can harvest fresh seasonal fruits, veggies and herbs as you need them instead of having to drive miles to the nearest grocery store. It just doesn’t get any fresher than that. Step #1. Decide What You Want to Plant. This is the fun part. Start by making a list of all the recipes you frequently make. Note which vegetables and herbs you use over and over again, because this will tell you not only what you should plant, but also in what quantity. Don’t forget to jot down other items your family enjoys, even if you aren’t using them in your cooking currently. Growing your own vegetable garden is a great way to expand your culinary horizons. This planning phase is a great time to get your children interested in gardening, too. Ask what they might like to grow or make fun suggestions if they are too young to come up with ideas on their own. Pumpkins, ornamental gourds and sunflowers (for their beauty and seeds) are popular choices with kids of all ages. Fast growing plants, such as lettuce and beans, are also great choices for children because they produce noticeable results quickly. Once you’ve made a list of plants you want to grow, collect mail order catalogs, search online or stop by your favorite garden center to find seeds and transplants. You can learn a lot about what grows well in your area by tapping into these resources, as well. 1. Sunshine. Pick a sunny location with at least 6 hours of direct sunlight per day. 2. Water. Make sure the location you choose has easy access to water. You will need to water your plants whenever Mother Nature refuses to cooperate, so make sure you have a convenient source of water nearby. 3. Accessibility. Gardens need care, so position your vegetable garden in an area that is convenient to get to with the tools you need to work in it. If you place it too far from the house or garden shed where you keep your tools or in an area difficult to reach with a wheelbarrow, you may find yourself tempted to neglect it. Make your life easier and plant your garden in the most convenient sunny location you can find. 4. Good Drainage. You may have to do some work for this one, especially if you live in an area with heavy clay or compacted soil. If you find the area you want to plant tends to collect standing water, you will want to build your beds up to protect your plants from overly wet feet. Once you’ve identified where you want your garden, you will need to decide where you want the individual beds within it. As you are doing so, keep in mind the orientation of the sun throughout the day because taller plants or those growing on trellises can cast damaging shadows if they aren’t positioned correctly. To create the individual beds, many old school gardeners swear by the traditional practice of removing heavy layers of sod, then tilling and amending the soil beneath it before planting your vegetable plants. Although this method will certainly work, you simply don’t have to work that hard. Instead, you can use the Lasagna Gardening method of building your beds UP instead of digging down to create them. This methods works equally well with raised garden beds or directly on the ground. To get started, add flattened cardboard or a thick stack of newspapers on top of the ground and then add alternate layers of peat, topsoil, aged manure or barn litter, organic mulch, yard clippings and/or compost. You can either prepare these beds months in advance or right before you plant. Either way, the layers will meld together into a beautiful, rich soil for your plants. For more details on this no-dig gardening method, check out Lasagna Gardening, a New Layering System for Bountiful Gardens. Once your beds are ready, it’s time to start planting! Before you start digging, you have some choices to make: you can sow seeds directly into the soil, start seeds indoors then harden them off outdoors before adding them to your garden, or plant established transplants you’ve purchased directly into your prepared beds. Some plants require direct sowing, while others need to be started indoors several weeks before the frost-free date in your area in order to perform well. While you are creating your list of plants you want to grow, make a note of the growing requirements for each so you can give your plants the best chance of survival. If you decide to follow these four easy steps to plant a vegetable garden, you will be rewarded all season long with an abundant supply of fresh and healthy produce. Plus, you’ll have the added satisfaction of knowing you did it with your own two hands. Return for Judiths next garden discussion March. 17, 2014. Growing Food Can Be Super Easy! You Can Do It!! Gardening in a small space? No problem! This is the second post on Vegetable Gardening with guest speaker Judith Sorg. If you missed the Introduction please link here to read: 3 Must Know Vegetable Gardening Tips. Now for -Deciding When to Plant Vegetables in Your Area- with Judith Sorg. Figuring out when to plant vegetables in your area requires a little detective work. In addition to your geographic location, you’ll need to consider a few other variables, as well. For example, the type of vegetables you plan to grow and how you intend to plant them, such as seedlings, transplants or seeds will factor into when you should get your crops in the ground, as well. If you live in an area with distinct seasons, your vegetable growing season will fall loosely between your anticipated frost-free date in the spring and the first hard frost in the fall. Unless you have a crystal ball, it is next to impossible to predict these dates with absolute certainty. Fortunately, there are some valuable online resources you can check for general guidelines. A quick online search for “frost-free date” + your geographic area should give you a good idea of when it might be safe to plant in your region. Of course, the published frost-free date for your area doesn’t take into account unexpected late season snow storms or unseasonably cold temperatures. However, if you wait until after the expected frost-free date for your area AND for the daytime soil temperature to reach 65 degrees or warmer, you should be in good shape. If you want to warm up your soil faster, you can cover your planting beds with dark plastic sheets for several weeks prior to planting. As you develop your garden planting timeline, think of these two important dates as virtual “bookends” around your prime vegetable growing season. However, if you start seeds indoors or protect your plants from cold temperatures with mulch, cold frames, row covers or mini-hoop houses, you can extend your growing season even further. 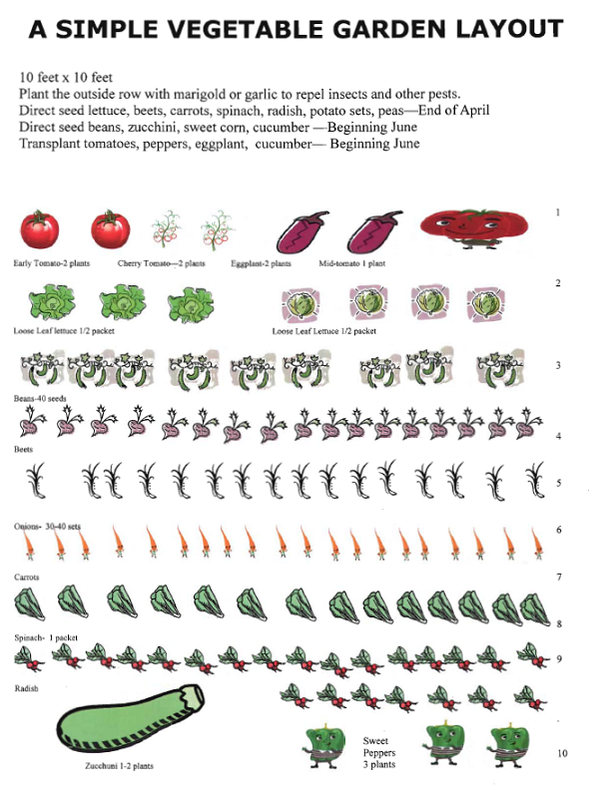 As you’re deciding when to plant vegetables in your garden, pay close attention the “days to maturity” information noted on the seed packages or plant markers for the vegetables you’ve selected. This number, which is often expressed as a range of days, tells you how long it will take until that plant is ready to harvest. This is important to know because some vegetables reach maturity much faster than others. For example, radishes, lettuce and baby carrots can be ready for harvest just 30 days after they are sown as seeds. On the other hand, some pumpkin varieties can take a full 120 – 160 days before they reach maturity. The “days to maturity” for a particular vegetable variety gives you an idea of how early you need to get that plant into the ground if you want it to reach maturity before your first hard frost date. It also tells you how late in the season you can plant certain crops. For example, you can’t wait until late summer in northern climates to plant pumpkins seeds that require 160 days to mature. On the other hand, you can plant fast-growing lettuce varieties with confidence until 30 days or so before your expected last frost date. Learning when to plant vegetables in your area is worth the effort. Knowing when your prime growing season begins and ends – and how you can get the most out of it – will make you a much more successful food gardener. It will help you decide which vegetables to grow and how to help those varieties thrive in your garden. Do you know what this thermometer means? Raised Bed Vegetable Gardens Worth It?